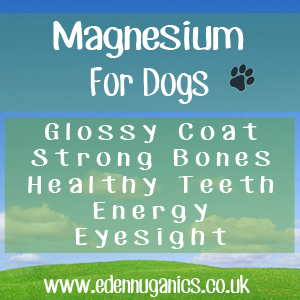 Magnesium plays a key role in the health of dogs and is needed for a huge number of important functions. A deficiency in this essential mineral can lead to a number of conditions including an increased sensitivity to noise, nervousness, irritability, apprehension, trembling, mental depression, confusion, twitching and insomnia. Magnesium is second only to potassium as the most abundant substance found in the cells of dogs making a deficiency in magnesium (also known as hypomagnesemia) a serious health concern. Around 50% of the magnesium found in your pet is stored in their bones with only around 1% being carried in the blood supply. When your pet is suffering from intestinal upsets such as diarrhoea, it can dramatically reduce levels of Magnesium throughout the body. Supplementation of magnesium can be useful at these times. Magnesium helps your dog absorb the mineral Calcium, vitamins C, E and B complex and plays a key role in the health of the nervous system. Convulsive seizures are known to be more common in dogs fed a magnesium-deficient diet. The daily magnesium dosages for dogs are: 10mg for small dogs; 20mg for medium dogs; 50mg for large dogs and 75mg for giant breeds. This should, where possible, be provided by a well balanced diet rather than supplementation. Glossy coat - Magnesium helps give your pet a lush, soft coat of fur as well as helping to stop premature grey hairs. In addition, a diet rich in magnesium is even thought to help stimulate new hair growth. Strong bones - It's not just Calcium that helps develop strong bones. There is growing evidence suggesting that Magnesium could be as vital as calcium when it comes to bone development. Without magnesium your dog would struggle to convert vitamin D into a usable form, impacting your pet's ability to absorb other key minerals. Healthy eyes - Magnesium helps to smooth and relax the eyes helping to avoid the twitches commonly associated with some species of dogs. It is also known to help protect the optic nerve and other tissues found at the back of the eye. Teeth - Magnesium is unique in the way it can help strengthen and re-mineralise the teeth of your dog. A diet rich in magnesium is known to lead to a dramatic decrease in gum disease. For this reason, many dental products designed for dog contain this powerful mineral. Energy - One of the key symptoms of magnesium deficiency in dogs is lack of energy. This essential dietary mineral is an important catalyst in a number of enzymatic reactions within your pet's body. A study, published in the March 2001 issue of the journal "Brain Research Bulletin," shows that low levels of magnesium ions in brain tissue often lead to reduced production of energy.